I can’t help but feel this card was originally designed just to see how whether there was a way to physically template the ability. If they had found creature types with one or two fewer letters, I wouldn’t have been surprised if they could have put even a couple more in the chain. Then again, there aren’t going to be many situations where you get up to the 9/9 and aren’t going to win. 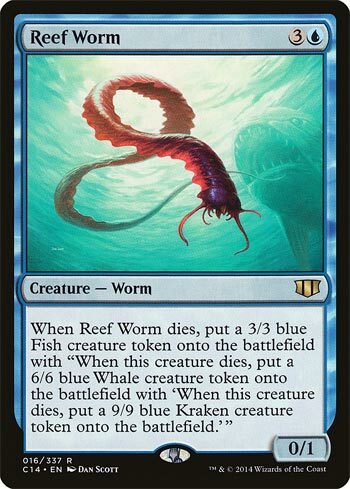 Your opponent will most likely be out of removal spells and/or creatures that can kill your ocean life; and that’s not even counting the times you might use something like Greater Gargadon to get the Kraken within one turn of playing the original Reef Worm. What a great design. Reef Worm is like a reverse Matryoshka doll where it keeps getting bigger culminating in a mighty 9/9. The weird thing about this card is that the ability really feels green, not blue. Not only that but green gives you access to sacrifice abilities, token replication, and a reason to run Kiora. As blue can only bounce creatures you’ll need to be running another color to take advantage of Reef Worm or else it is just a blocker. One of the most wonderfully flavorful creatures in a while Reef Worm is proof that lowly bait can attract the big fish. Of course a 0/1 for 4 mana is bad, but it’s better to think of this as more than that. It steps up to a 3/3, then a 6/6, and finally a majestic 9/9 with a surfeit of tentacles. This synergizes very well with sacrifice outlets or token-replicating effects (like Doubling Season, natch), and it also works well with cloning effects. It takes a bit of investment to get to work, but the payoff is pretty legit.